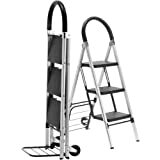 The cool new Travel Smart LadderKart combines a stepladder with a hand truck / cart so you can easily go to new heights or move your heavy stuff to new distances. This compact all-in-one ladder cart easily converts from a step ladder to a hand cart in seconds and features large 12 inch steps, built-in wheels that also fold in for safety, a release handle for easy closure, and the hand cart has a weight capacity of 175 pounds while the step ladder has a weight capacity of 250 pounds. A great space-saving solution.